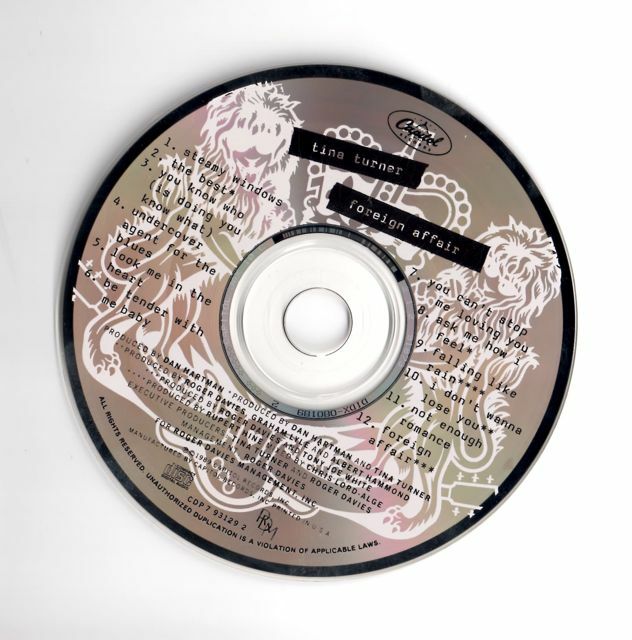 TINA TURNER Foreign Affair (1989 UK limited edition 12-track CD album including The Best and Steamy Window, in special 7″ x 5″ (appr. 17 x 13 cm) passport pack with integral 16-page booklet and gold embossed artist/title/logo on the cover). This edition of Tina Turner’s Foreign Affair album is limited. It has the Original album “foreign Affair”. The Presentation of this Limited Edition: It comes in a custom passport design with a designed Tina Turner Coat Of Arms on the cover. 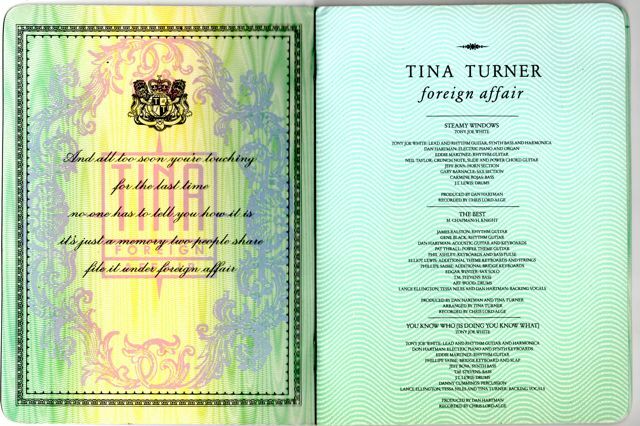 Inside we get the wavy background that reads Tina Turner Foreign Affair, which is repeated just like inside a real passport. No detail is left out here, the passport cover is a Navy Blue/Indigo colour with Gold Colour printing for the titles and Emblem. 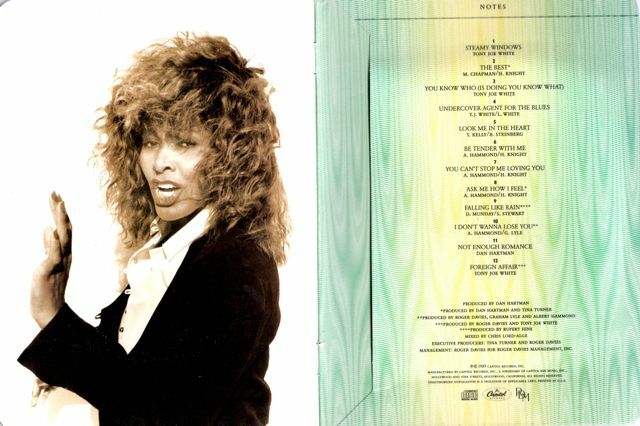 The back of the front cover has Tina Turner’s album Logo in a blasted rosy pink colour, which turns purple towards the right. It also features some lyrics from the title track, in a handwritten style. 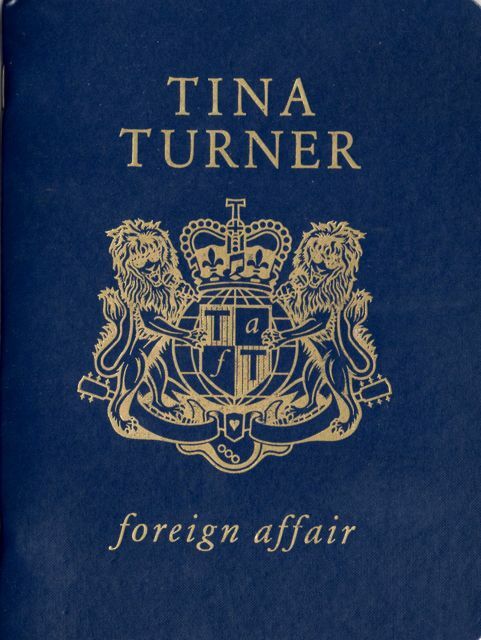 After the song credits we get a passport details page for Tina Turner with a nice photo and a printed signature. The following pages contain the photographs from the Foreign Affair album artwork shoot. The complete set is resented here in a scrapbook/photo album feel way. The Middle Page contains the Iconic Image by Herb Ritts that appears on the Foreign Affair Tour Programme and the Steamy Windows Single Cover. The back page has a full-page photograph of Tina. Detail is that the song titles appear over the each of the pages in a passport stamp nature. All individually designed with the credits for the writers, composers and producers within each unique shape. The Disc comes in a white slip cloth that is housed inside a pocket at the back that you slide the Disc into… So basically a Limited Edition that goes well with the Foreign Affair Concept. An Collector’s item that is becoming increasingly rare to find as it has been deleted for many years. Passport has release number CDP 7 93129 2 and states “Printed in UK”. Disc has number CDP 7 91873 2 with artwork similar to the regular UK release. CD states “Made in Austria”, although it is said there is also a disc with matching passport artwork. I loved this cd and still do. Every chance I get I play it. Not only does Tina looks smashing, beautiful, youthful and energetic, she sounds perfect on this cd. There’s no one that can will replace her. There’s only one TINA TURNER. I just love everything about this album and that part of her carrier. My favourite one for sure. This is my favourite album along with Private Dancer. I play them often. Tina will always be the best. I just got this Passport edition. I was so excited to finally have it and The passport is just fantastic im so impressed with the quality of it. As mentioned in the article above, they spared no details on it. I want to sleep with it under my pillow tonight. Get one if you can!! Hey Mark, that’s great! It is indeed a very nice item to add to your collection! Did you get your Passport with the regular FA cd (like Sjef) or with the cd presented here (like Ben aka me) ? Hi Ben, I was disappointed that mine is the regular CD rather than this cool looking one that you have here. But alas, at least I have the passport. Do you know why yours is different, was is a first printing or available only in certain countries?